Set with it's backdrop of beautiful Cretan mountains and overlooking sparkling Makrigialos Bay, Grapevines is a brand new complex of 20 luxury European style townhouses on a gated site, set around a private courtyard with a large floodlit swimming pool as its centrepiece. Our property is in the south facing block well back from the road and has all the amenities needed for a relaxing self-catering holiday in tranquil spacious surroundings: 2 bedrooms, modern kitchen, bathroom and shower room, secluded balconies and roof sun terrace, private garden and car parking. A delightful blue flag beach is only a 5 minute walk away. Makrigialos, which is easily accessible from both of Crete's airports at Heraklion and Sitia, has a picturesque harbour and promenade with waterside tavernas, restaurants and cafes. Behind the village lie beautiful Cretan hills and mountains with out of the way tavernas serving traditional Cretan cuisine. All along the coast are fine beaches and secluded coves. En-suite to bedroom 1 on first floor. Bathroom with wc, bath and a shower on ground floor. There is a beautiful 20M unheared pool as a centre attraction in the complex, it's filled for May 1st and stays in use to November. Notes on accommodation: Air-conditioned in all rooms with quiet night time setting. Suitable for children with large private garden area to rear. Quiet area. 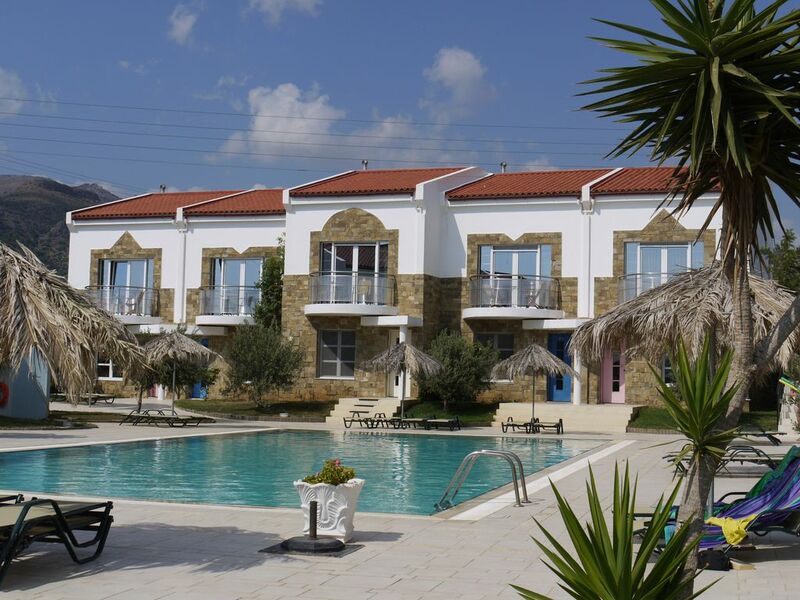 Outside: Gardens,floodlit swimming pool 20m shared amongst 20 villas. large garden area to rear with furnished patio area off kitchen/diner, private panoramic roof terrace furnished with sunbeds. Utility Room: Washing machine,iorn and iorning board Cleaning / Towels / Linen / Maid service: Linen, house towels and beach towels provided. Fantastic accommodation and everything you could wish for a perfect family holiday! The accommodation was exactly as advertised, clean and brilliantly equipped. Location and setting were perfect- large shared swimming pool where our boys (12 and 8) made friends. Resort beautiful. Literally the best family holiday we’ve had! Thanks Fiona, glad you enjoyed your holiday in Grapevines and Makrigialos. It's just a wonderful relaxing little village. Hope to welcome you back sometime in the not to distant future. Makrigialos (long beach) has 5 beaches. The closest less than 100 metres from the villa is a sandy blue flag beach with sunbeds and water sports in summer. Just 10 minutes walk away there is another virtually deserted beach with a handful of sunbeds and hammocks. Towards the harbour (10 minutes walk) is the long beach, a narrow, gently shelving beach ideal for families. CHEAP FLIGHTS FOR 2015 NOW AVAILABLE FROM ALL MAJOR AIRPORTS. Hire car ir recommended and can be arranged for you. 120km from Heraklion. 45km from Sitia airport. Makri Gialos is literally translated as 'long shore’. The long beach and several sandy coves that are never overcrowded, provide excellent conditions for swimmers of all experience and children due to the soft, gently shelving main beach and clean, clear blue water. Makrigialos now has become a popular resort due to its beautiful bay, long sandy beach and the friendly local hospitality. It is still unspoiled and an ideal spot for those searching for quiet holidays, with visitors returning year after year. The long sandy beach has crystal clear shallow waters and is perfect for children and non- swimmers,in summer it has a selection of water sports. The beach is lined with a good variety of tavernas to suit all tastes, the fishing harbour being the most picturesque part of the village. Makrigialos has a very good supply of shops, tavernas, cafes, and water sport facilities, disco bars, one bank, pharmacy, doctor, dentist, car rental, florist and car service stations. There is a street market (9.00-14.00) each Friday on the cross road to Agios Stefanos, near the harbour entrance. In traditional tavernas meat, fish and other local dishes are served. The numerous fish tavernas also serve fresh fish caught locally. In all restaurants and cafes, the quality of the food is excellent and prices are reasonable. The excellent climate of the area (around 340 sunny days per year), the beautiful landscape and the warm hospitality attracts visitors of all ages. Booking Notes: Please contact owner for booking details. Currently great deals on low season lets, 10% discount on second week (not in high season). House is Eot licenced Licence no MHTE 1040K91003096101 Due to a cancellation the first 2 weeks in Aug is still available. Changeover Day: Contact the owner Notes on prices: Prices are for the property per week in UK Pounds. Good discounts for long winter lets,10% discount on second week(not in high season) Good deals on last minute bookings. Due to a Cancellation the first 2weeks in Aug is still available.